It is always exciting getting the new the new season collection from Orla Kiely. First in this season has been the "Sycamore Print in Graphite". We have, Midi, Shoulder, Tote, Baby and Travel bags in this colour way. Navy/Graphite and Cream, great colours that easy to match up with most outfits. There is also a Amethyst/pinky red colour which i did not like so did not buy! Next up is the Classic print in black. Big Stem design in a cream colour, make this a realy lovely strong design from Orla Kiely. We have this style in the Midi, Shoulder, Handbag and Travel bag. 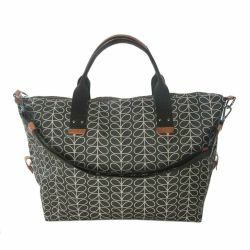 Lastly from the Canvas range we have the Travel bags and Tote bags in the Dusk print. 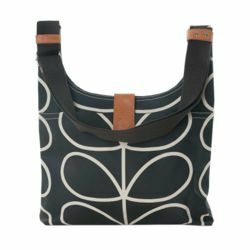 See the right hand image below of the "travel bag"
Here at kathleen McAuliffe we were one of the first stores in Ireland to stock Orla Kiely in 2005. 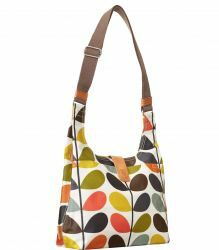 Our range is carefully selected to give you the best possible Orla Kiely from what is now a huge range. we tend to stick to the "core prouducts" like the Bags and Clothes. We always stock the much loved Signature Stem print range in the Canvas laminated. This print changes twice a year. 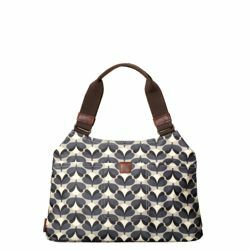 For summer 2013 it is very much a classic with cream base colour and bright stem print, that makes it a fun easy to wear bag. We always carry the Midi and Shoulder bag and the long Zip wallets from this range. The Stem print is now a bit of a Love it or hate prints Which is why we always carry a range of the other prints on offer. For summer 2013 we have the sweetpea in cyclamen which is a lovely summer print. see below. 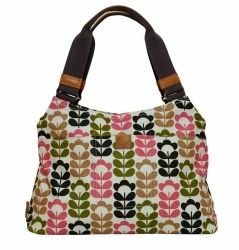 The Leather bags from Orla Kiely are wonderfull !. 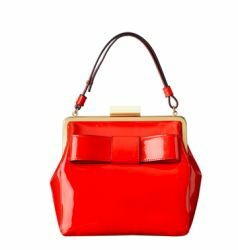 I am in love with this Holly bag from the summer collection. Lots more styles as well as clothes in our main online shopping area. I found this great litttle movie of the Spring 2013 collection. Called "Darlin" . It screened in a camper—customized with one of the designer's signature prints—set up in the back of Kiely's Mercer Street store. The new collection was "inspired by Palm Springs, Slim Aarons, summer resorts from the 1960s, and the pool culture of that time period," Kiely told ELLE.com. So it was only appropriate that the video, directed by Maximilla Lukacs and styled by Kiely's longtime collaborator Leith Clark, was filmed in Palm Springs.